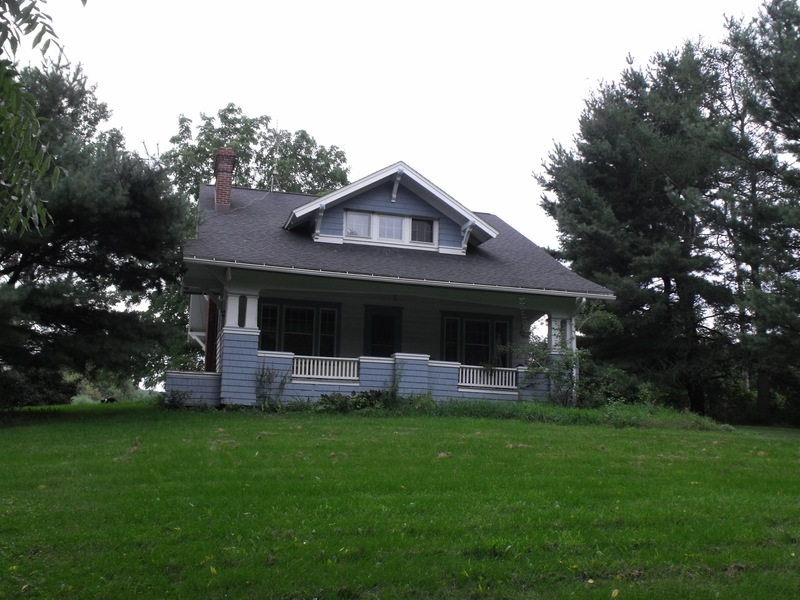 This is the cute Sears Catalog house (yes that Sears – came in on the train in 1926) that served as the primary residence on the farm. 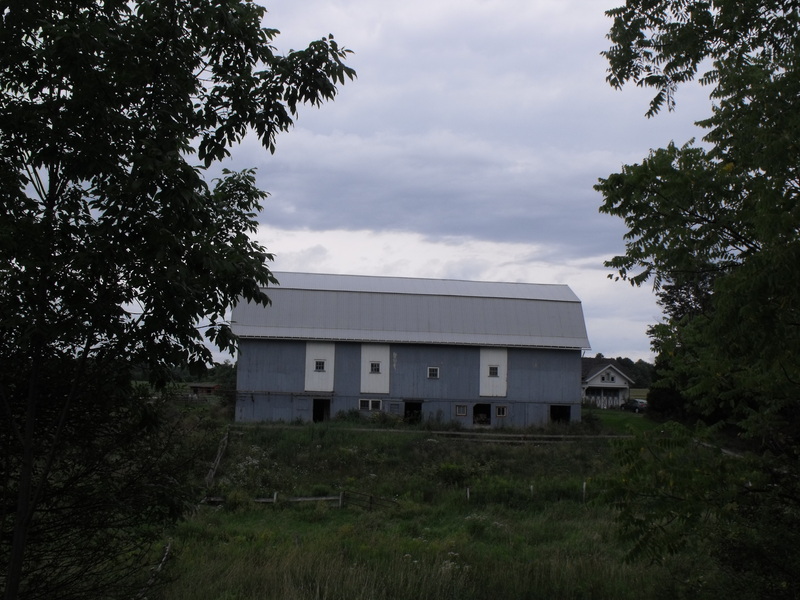 For almost a couple of decades, I thought my dream life included retiring and spending my golden years (curious terminology for growing old and decrepit) at the farm. About five years ago, I broke my leg in a very bad way with a bed rest layup that lasted close to three months. Getting back into shape and into gear took a whole lot longer. I literally turned five trucks around headed to the farm with winter client horses coming in for starting under saddle training. By the first week, I was shelling out thousands in vet bills for a mare that had managed to pound a four-inch nail almost all the way into her hoof (poor girl). This went unnoticed by the emergency help hired until she was in so much pain and distress, she couldn’t get up. We did manage to save her, but it wasn’t easy. I felt helpless and powerless as I blacked-out struggling to get to the barn to diagnose and treat. 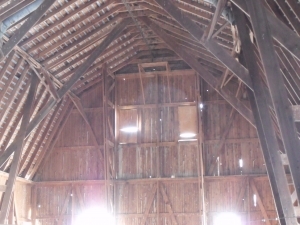 This old truss barn is incredible to experience from inside. 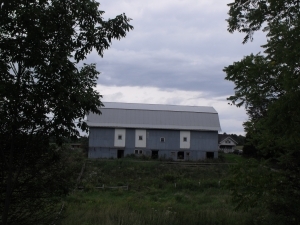 At first, I was put off by the cow barn look, but that thick foundation and bank construction made the barn comfortable for all seasons. It iss amazing how well the earth moderates temperatures. That was the beginning of a realization I wasn’t indestructible. I always believed my bones were too big and too hard to break (sans fingers, of course). After the long and hard rehab required to get me sound enough to resume horse training activities (albeit at a lesser level), I realized I needed consistent and permanent help. My goal was to staff the farm with horse care and training support. The first was a delightful young gal who misrepresented her horse experience, but relished instruction and quickly absorbed new lessons learned. I donated a lot of time (while paying her to learn) with the expectation she would stay. She left after eight months to ‘find herself’. The last was a mature woman that quit via e-mail as horses stood tacked in the barn for her scheduled arrival time (two hours earlier). I figured wrong that maturity would bring responsibility. 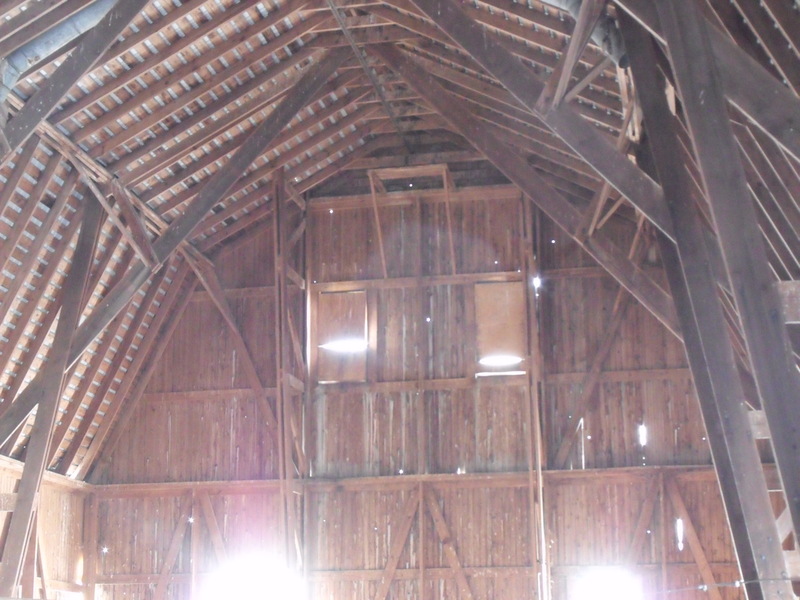 It’s impossible to get a true sense for the magnificence of the construction on this barn from a photo. This loft was 100-feet long and about three stories high (with a 7000 square foot roof). Gatsby’s death last year (and our combined inability to school Remi as a suitable replacement) served as the final proverbial nail in the coffin. He was the best assistant horse trainer anyone could ever hope for. With him gone, I felt vulnerable schooling these young horses on the 117-acres of Halcyon Acres®. I was perfectly capable of hanging on and holding on, but it begged the question – why? Horses had been my lifeblood for most of my living years. Sadly, I realized that unparalleled joy wasn’t there anymore. I was burnt out by too much of a good thing. Farm horse demands, client projects and galloping had me often riding 20 horses or more a day. Injuries were starting to catch up. I was tired. So, I made the hard decision to leave the next 20 – or 50 years – to another as caretaker of this beautiful place. This was just recently finalized (and it took every waking minute I had that wasn’t already committed elsewhere to orchestrate the move). There’s virtually no market for horses in this area of New York State. Many are choosing to euthanize – the irresponsible are simply abandoning (news stories are rife with tales of breeders walking away from a herd they created, leaving them to fend for themselves – very sad). 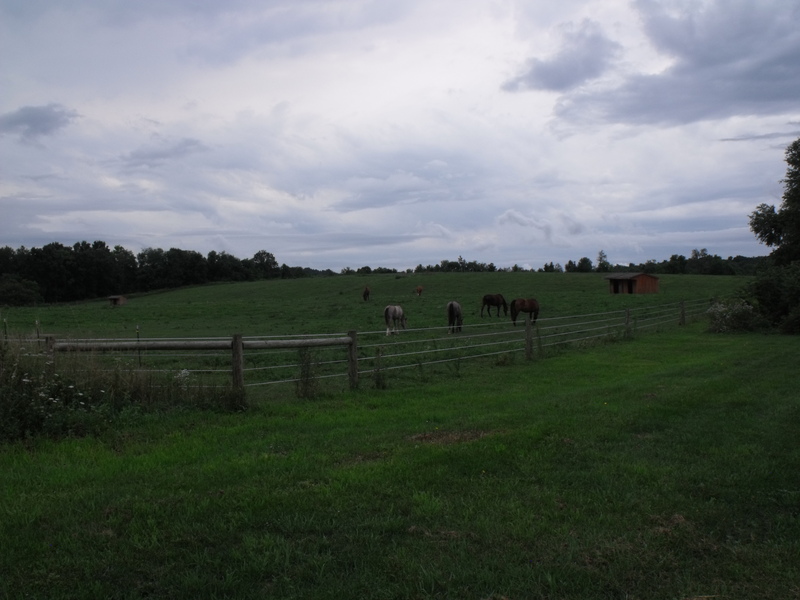 My first plan was to take care of re-homing horses before listing. Eventually, I decided to do both at the same time. I was shocked when offers started coming in immediately on the farm (I figured I’d have a couple of years). The search for horse buyers went national (the kids trucked to buyers as far south as Oklahoma and west to Minnesota – with peer pairs sold together when possible). Horses were priced low enough to not only justify additional trucking expenses, but also permit serious vetting from me to ensure each match was the best possible fit for horse and human (multiple interested buyers for each horse) with housing accommodations, buyer personality and equine career intent. I encouraged people to check me out with equine professionals in their state – and talk to recent buyers of other horses from the farm. Amazingly, most were bought sight-unseen. HorseClicks proved to be the most effective venue (I had never heard of this site prior to this year – but found almost all inquiries from here were from serious buyers – and there were a lot of them). I offered some buyers a second horse (those that might have been hard to place) with the purchase of their primary desire. Of course, a great home, good fit and herd member buddy placement were big considerations here. Full disclosure always – conversations included discussions about any quirks or issues that might arise if/when the horse came to them. This ensured every buyer was a good fit (at least the ones that were honest – only one wasn’t and while I’m sickened to have ignored my gut on this one, the horses had already shipped out of state when I realized that pang was trying to tell me something I wasn’t hearing). Some horses were sold to a better home for less than what other buyers were eager to pay. These decisions were not only good for the soul, but netted extremely appreciative and vocal buyers whose word-of-mouth has been priceless. Of course, the beauty of this property is all about the land. 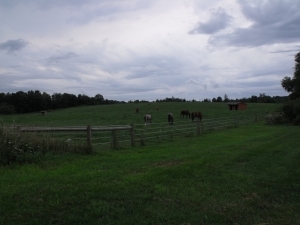 The horses enjoyed having a small part of it as their 30-acre pasture. 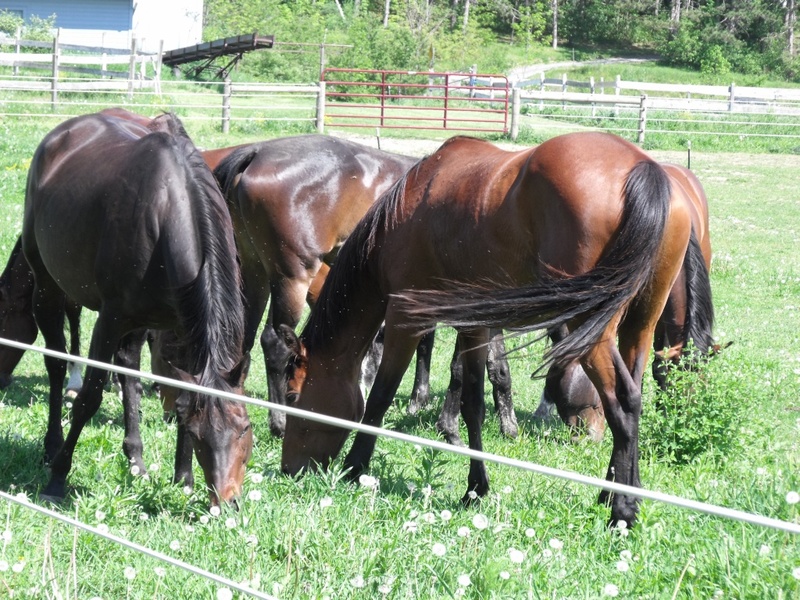 It’s been wonderful to hear how easily and happily the horses are settling into their new lives and homes. I’ve become friends with most of the buyers and relish the updates, pictures and opportunity to live vicariously through their stories and joy. I’ve been lucky to find such perfect new lifetime homes for most. All are enjoying being pampered by a human that’s theirs alone and are stepping up to exceed expectations in appreciation. What’s next with Horse Sense and Cents®? 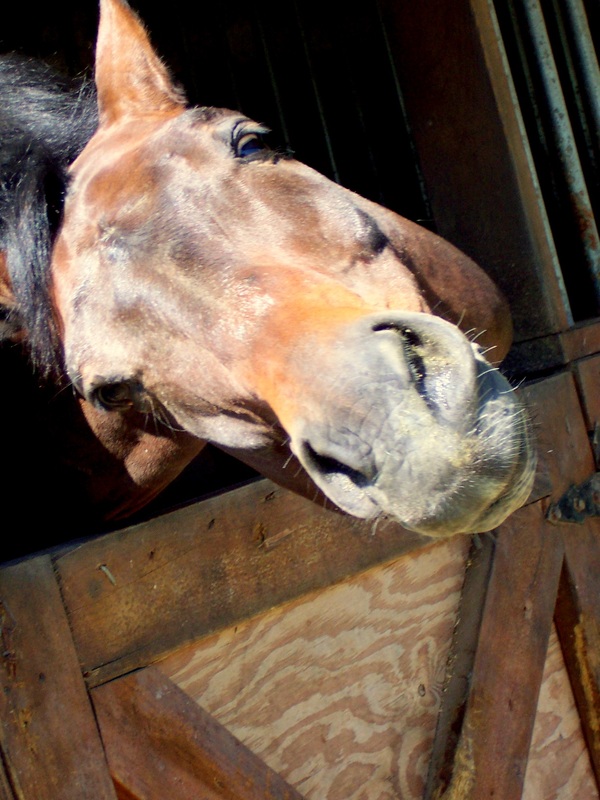 Don’t worry – you’ll still be getting a lot of valuable horse training content, care tips, resources and creative ideas along with help with your equine challenges through this blog, our products and services. In fact, I’ll likely be able to gain some great new insight from perspectives and experiences gleaned from a remote approach to training that will likely require including the horse owner every step of the way. This will be a great learning opportunity for me and a way to give in more meaningful ways as I move forward with an aim to keep both the horse and the human in the conversation. We’re launching some exciting new initiatives (some are already out there) that I’ll update you on in a later post. Stick around to have some laughs, find new ways to reach your horse and Enjoy the Ride! Enough of winter already! 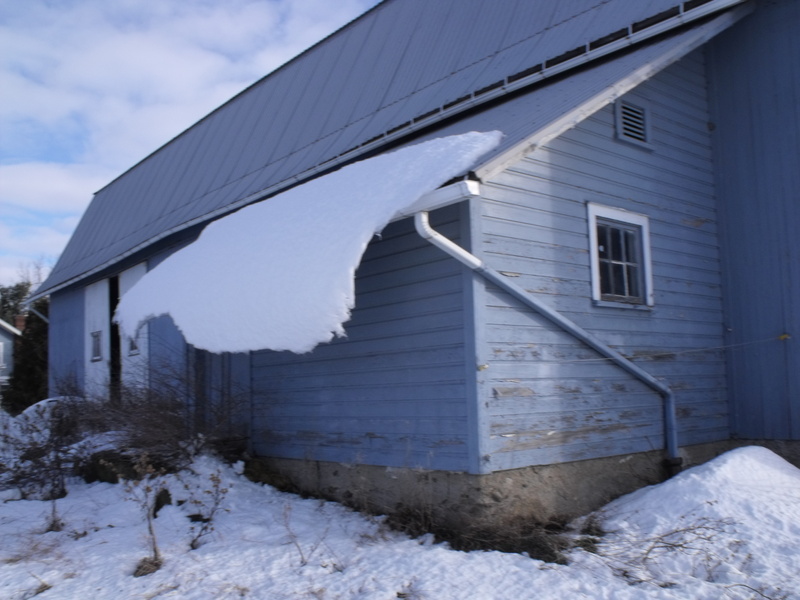 The snow even wants to hang on to the barn roof. It’s snowing again – pelting and stinging missiles brought forth from another day (actually night at this point) of 30 mph winds. The horses here are suffering from this extended brutal winter, as am I. Last year, I was busy harvesting some of the vegetable produce from the garden by now, with (very unusual) temperatures in the 80s beginning March 15th. 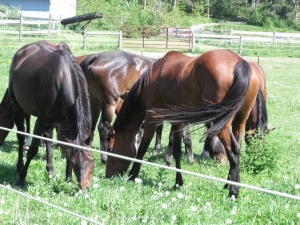 The horses were grazing on lush grass, dappled, completely shed out, robust and happy. This year, those remaining at Halcyon Acres® (the ones who have trucked out to anywhere else in the country had hair coming out in clouds almost immediately) are hanging onto their winter coats with zeal. It’s probably a good thing. In the twenty years I’ve been at this Upstate New York farm, I can’t recall a more punishing winter. I can take the snow – and often relish it. We didn’t have much of that this year, but the frigid temperatures, non-stop whipping wind and high humidity (something new, yet seemingly all-season lately in this corner of the word) has made this the most challenging winter I’ve ever had in my more than 40 years of owning horses. Add last year’s horrid hay season (major drought conditions) and the transport of most quality forage out-of-state to the mix and it’s no wonder the horses here are struggling to maintain their weight. I’ve never seen anything like it (other horse owners in the area are expressing similar challenges). It’s hard to capture the intensity and wonder of this sight in a photo, but this is the back side of that snow hanging on to the roof of the tack room at Halcyon Acres pictured from another angle above. Perhaps locking a horse in stall for the season could mitigate some of these effects, but there’s a price to be paid for such an approach (well beyond monetary). Even with 24/7 hay, the horses are already shunning shelter to try to graze the 30 acres they’re confined to. Those coming in at night for manufactured feed and special hay (most of the time they might saunter over, but aren’t particularly interested) are galloping to the gate when called. I’m so ready for spring. These poor horses need it more than I do. It’s probably going to be another year without a spring (my favorite season). Even so, I’ll welcome summer if it means and end to this punishing winter. Even if you’re against blanketing, when weather is severe, some need help. 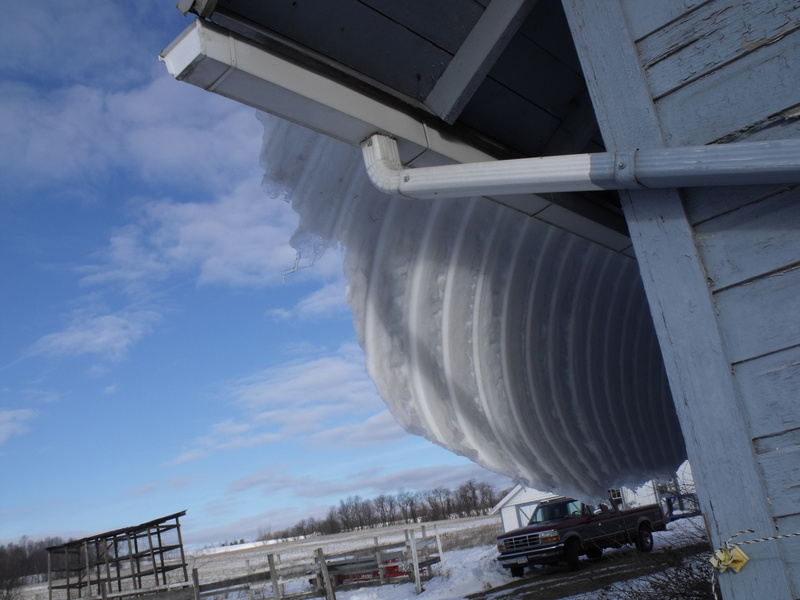 Older horses, those with sensitive or compromised systems and others who are struggling getting through a harsher or longer season than normal might need some help with warmth. While constant access to hay can help here, some need more. Just make sure you check every day by removing blankets to ensure no sores, rubbing or issues with bad fit. Take them off when the weather warms or you may risk pneumonia cases due to sweating. Rain sheets are a relatively inexpensive way (about $60) to give extra protection or help when precipitation is heavy, winds are brutal or for horses with heat loss signs. The issue is usually deeper when you see snow melting on a horse’s coat (it’s normal to see this in close to freezing temperatures or after a good frolic in the field), but at least you can offer some short-term relief by offering to help keep coats dry. Ensure water is always and easily available. Dehydration in winter is a common cause for colic. Provide shelter always. Your horse may not use it but at least offer the option. Give constant access to hay to help your horse generate body heat. Check your horse daily for injuries, issues and comfort. If she’s shivering, she’s burning off a lot more calories to stay warm and might require more help from you than usual. Run your hand across his back, shoulder, hips and barrel to ensure you don’t feel bone. Winter coats (and blankets) can hide weight loss before you see it. Pray, hope, dance or do whatever it is you do to call for spring. P.S. I wrote this post yesterday. Today was a beautiful day (forgot what it felt like to be out in the sun) and it looks like we’re on easy street for the next week or so with lows forecast in the 20s and 30s. We’ll see if it lasts. If you’re not doing anything the evening of March 9th, there’s an interesting film scheduled on the Hallmark Movie Channel. I haven’t seen it, but have been back and forth with the publicist for this movie for the better part of a month. It seems like a movie worth the watch. This is a family Western. Father and daughter ride and act together in this movie. Ricky Schroder (you may remember him from Lonesome Dove, Silver Spoons or NYPD: Blue and the film, The Champ, a role where he earned a Golden Globe award at the age of three) and his wife, Andrea wrote the script for this one. He (Ricky) decided to give his daughter, Cambrie, an introduction to her dream of acting without the perils and loss of innocence so often associated with the Hollywood scene. Cambrie stars in this film with her father as co-star and producer. In fact, the movie includes the whole family, with sons Luke and Holden serving as antagonists. Daughter Faith, wife Andrea and even Ziggy, the family dog are included in the onscreen talent mix. 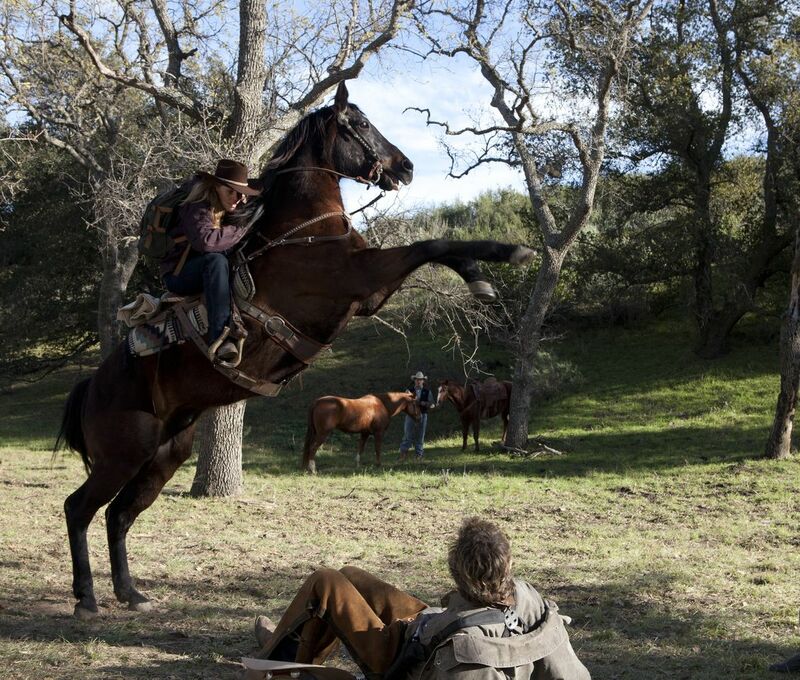 Tommy might be the biggest star, portraying Bravo, the horse featured in the film. Since Cambrie is a seasoned rider, she found working with this additional co-star fun and easy. The plot of Wild Hearts has been done before – young girl seeks connection with lost family and meets a horse that touches her deeply – but it sounds like a fun watch. Curious about the selection process, I asked how and why Hallmark picked up this film. The short story is, Ricky happened to be in another film recently on the Hallmark Movie Channel opposite Luke Perry, namely Goodnight for Justice: Queen of Hearts, which garnered the highest ratings for the channel so far. Ricky (of Ricky Schroder Productions – producers of this movie) knew this would be a good fit. 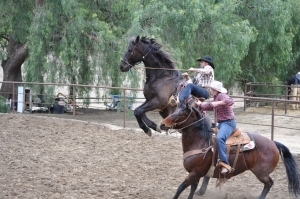 Apparently a lot of professional horsemen were involved in the production (including Pro Rodeo members, NHSRA and CHSRA) with stunts and fill in roles, which has garnered good support from the horse community. A Facebook Page provides updates at https://www.facebook.com/hallmarkmoviechannel. You can also follow @RickySchroder or @CambrieSchroder on Twitter for personal messages. Hallmark has a trailer and other information on the premiere at http://hallmarkmoviechannel.com/hmc/wildhearts. I’ll be curious to hear your reaction to the movie. Please feel free to share in the comments below. About a year ago, Horse Sense and Cents® began offering audio products. This has involved a lot of lessons learned the hard way, trial and error and occasional frustration, but it’s exciting to see success. Sometimes the simplest solutions prove to be the best. Most recently, we started making the books and e-booklets available through Amazon, iTunes and a number of other online sites as audio downloads. For these we found a royalty-share resource (more on this later). Their ability to get these titles listed where we could not as a small publisher made all the difference. What’s been amazing is how quickly sales have started to come in for these products with virtually no promotion on our part. What’s even more surprising is how many seem to prefer listening to reading, as the e-booklets are less than half the price but the audio products seem to be more popular. 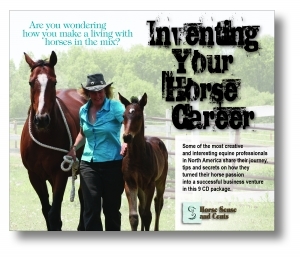 Our first foray into the retail audio arena was in December 2011 with the Inventing Your Horse Career CD series. We spent a ton of time and money researching and buying quality recording equipment, designing the packaging, manufacturing the product and arranging for warehousing and fulfillment. Of course, that was all after the considerable effort designing the perfect mix of contributors and devoting hundreds of hours to gathering information, interviews, editing and infrastructure to make a big splash. It was an interesting learning experience. We had to amend the design of our Kindle e-booklets to fit the square requirements for audio covers via ACX. Today, we’re partnering with ACX on the book and e-booklet titles. 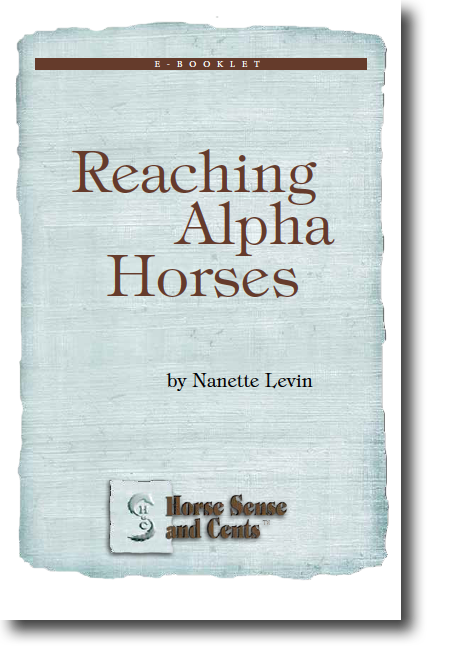 Reaching Alpha Horses was completed in mid-December and available on Amazon almost immediately. A few days later, Reaching Alpha Horses was on iTunes. Bringing home an off-the-track Thoroughbred was approved January 18th, immediately available on Amazon Audible and on iTunes to following day. We should have the full length Turning Challenging Horses into Willing Partners completed within the next week and live on various sites as an audio product in February. 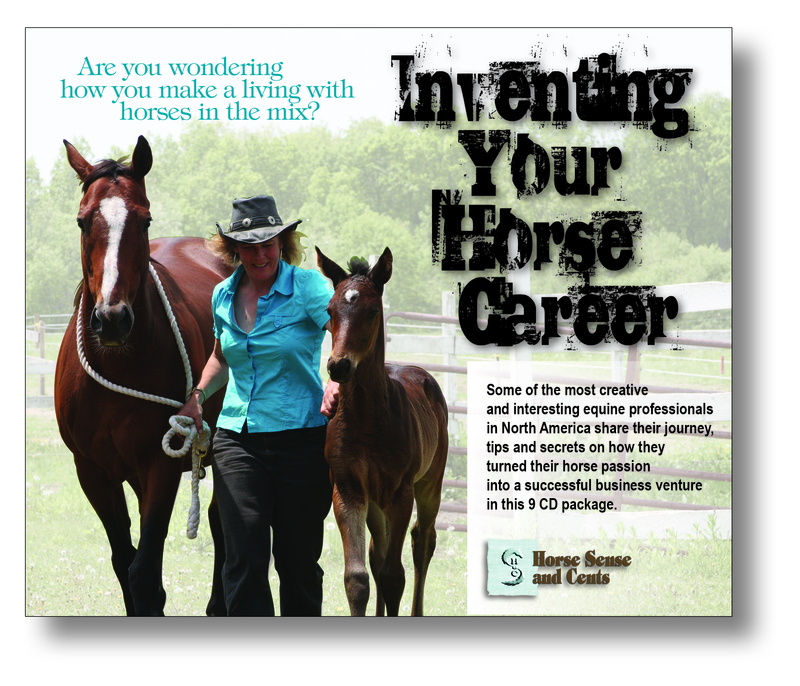 The thinking with the Inventing Your Horse Career CD Series was horse owners spend a ton of time in their cars (more often trucks), most have probably at least fantasized about a career with horses in the mix and many would appreciate having an attractively boxed package to own or give as a gift. Since it was so hard to find great material on alternative equine careers, we thought there would be a high demand for a resource that put it all together in one place. All involved felt the research, time and money required to put this together would help younger equestrians or more mature adults (with many starting horse-related small businesses as a second career) get a head start – or leg up, so to speak – in careers where others had learned many lessons the hard way. In fact, some of the contributors to this series literally invented the industry niches where they now prosper. All have great stories to tell and a generous philosophy of giving back to help future equestrian entrepreneurs. Each was amazed with the quality of the final product – and lineup of co-contributors. So, we figured the product would be a big hit. We were wrong. Whether it was poor promotion, the CD format, the length of the series (it’s 9 CDs of content at about one hour each), timing or something else, we weren’t scrambling to keep up with demand as imagined. Nor did we have buyers clamoring for updates with new featured equine visionaries annually (initially our plan was to start production of a second series about six months after the first was released – that’s postponed – perhaps indefinitely). So, for those of you who prefer CDs to MP3s, we’re selling out our remaining stock of the boxed CD set at half off as we transition to a digital download only model. It’s a great gift to be treasured by you or someone special with an amazing mix of knowledge, insight, stories and tips. If MP3 is your preference, we’re offering a special price for single downloads of $9.99 (normally $15.99) through March on the Horse Sense and Cents® website. There’s no way right now (at least not that we’ve found) to run this through ACX, so we still working on strategies to get it listed with the big boys. ACX (Audiobook Creation Exchange) came up several times in the six months of research I did trying to figure out how to get our Inventing Your Horse Career MP3 offerings listed on iTunes and other sites where people tend to go to find material that satisfies their listening pleasures. This is a relatively young company. They’re doing a lot of things right. Basically, it’s resource that connects voiceover talent with publishers and authors. What’s even more awesome about the offerings, though, is they’ve established relationships with the online retail giants, so once your product goes through their quality control process, you’re in. I’ve been thrilled with this company thus far. I would strongly recommend using the voiceover talent option (you don’t have to) if your title lends itself well to being narrated by another (if you do a royalty share arrangement, their motivation is equal to yours in seeing the product sell). For Eleven Quick Tips on using ACX and a bit more information on the discovery of this resource, visit http://www.nanettelevin.com. Where do you go to find horse audio products? Given our challenges with the Inventing Your Horse Career Series, particularly as it relates to getting the MP3s listed, I’d love to hear your ideas or experiences with sites that offer audio products for sale. What’s your favorite place to visit? Where do you find the best horse stuff? Do you sell audio products through a resource you relish and are willing the share your find? Please consider participating in the comment section below, or if you’d prefer to respond privately, you’re welcome to contact me at Nlevin@HorseSenseAndCents.com. Thanks! Some of my best assistant trainers haven’t been people. When you’re trying to reach confused, concerned or belligerent horses, often animals can be better teachers when it comes to addressing young horse training issues. Who says dogs and horses don’t mix? Even maiden moms knew their newborns were safe with Gatsby. Anyone who reads this blog regularly knows Gatsby served as one of the best equine assistant trainers I’ve ever encountered. I was lucky to have his help for fifteen years. He was a mutt I picked up from the Rochester City Pound who had an uncanny ability to read, comfort and guide horses in a way that made them feel brighter, bolder and safer in all that was requested. 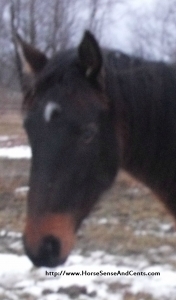 Even new client horses coming to Halcyon Acres® seemed to recognize with him around, they’d stay safe. I felt a lot safer too (on and off horses – he had a lethal jaw and, as amiable as he was, I always knew he’d use it to protect me). He calmed horses through painful doctoring, helped with young horse training on the trails, assuring and then desensitizing, comforted horses that were concerned and even welcomed each new foal. I’ve never seen anything like it – even maiden mares would allow Gatsby to get close to their newborns. There was an energy about him that every horse picked up on and appreciated. In fact, when he died and was buried on the property this summer, the farm horses went nuts. They couldn’t see him but somehow they knew. I miss him so much, but will remember all he taught me about horse sense for the rest of my life. Leah has always been an interesting character. As a yearling, she challenged the bully in the pasture (not the leader) who commanded a large run in shed for herself. Leah didn’t get violent, she simply wouldn’t be intimidated by this mare’s posturing. When the rest of the herd witnessed her bravado, they began to follow her lead on many other things. If I’m not hasty with fresh water in winter, the entire herd waits for Leah to land a crushing hoof through the ice surface. She never claims first dibs. She’s always been one of these fillies that lets you know she’s choosing to cooperate. For each request there’s a moment where she pauses to make sure you know she knows she doesn’t have to. It’s quite comical, actually. I laughed out loud watching my novice employee start Leah under saddle. After six months of riding lessons and helping start young client horses, this gal wanted a project she could learn from alone. Ordinarily, this would have been an impossible request. I recognized, though, I had a very special filly born at the farm. Her smarts, kindness and confidence proved green hands with a green horse could work. As I watched the scenes unfold from my office window above, Leah proved to be the old soul with a sense of humor I knew. It was hysterical to witness Leah enforcing lessons when words were forgotten. Lowing an iron before climbing aboard was one of them. Leah walk off just fast enough so this gal would be hopping on one foot with her other in the stirrup. This usually went on for a half hour before the light bulb moment. As soon as the rider dropped her iron, Leah stood. Through every step, Leah gently pushed back until the student got it right. Irony can be fun when you see it coming. Leah’s also my go-to gal for providing client horse companionship for singles (which always includes some schooling). Usually, customers who send only one horse have gotten stuck trying to go it alone. So, there are issues to be undone before tackling new activities. At the tender age of three, Leah’s totally cool being removed from the herd (some of her tight peers aren’t so comfortable). This usually involves her spending half the time in a stall and the rest turned out with a newbie and his behavioral issues. She helps me by eliminating most of the attitude problems non-violently, while I treat her to extra goodies and attention. Still, it’s incredible to witness the adaptability and smarts of this young gal. Most horses of any age would stress out and act out with such a dramatic change. She joyfully rolls with the punches, delighted to find new ways to keep that busy mind engaged. It’s wonderful to have such willing helpers. There are other horses that get culled for particular issues, but Leah usually gets first call for the most challenging tasks. Wise beyond her years is an understatement. Of course, she’s been teaching me along the way too. 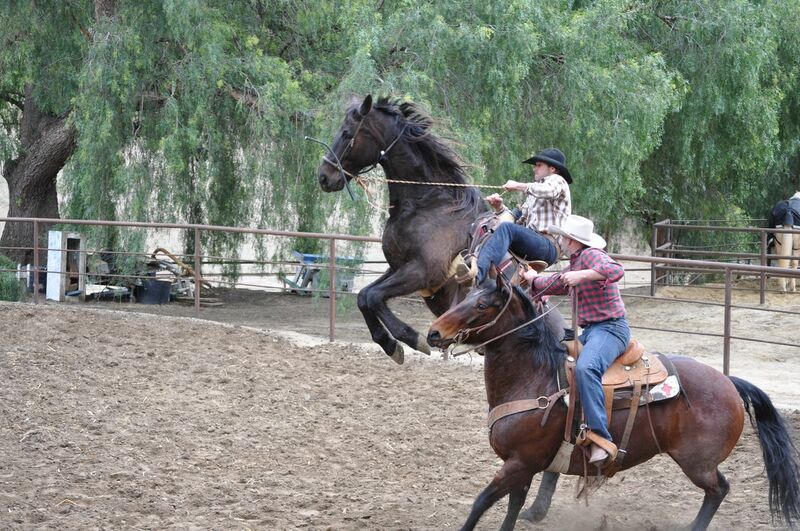 Each horse gives you new learning opportunities. This one has taught me more than most about how to be clever and kind with equine communications – whether directed at humans or horses. She’s a hoot. Do you have animal companions around the farm you use to help you with horse challenges? I’d love to hear about them in the comments, and imagine blog readers here would too. Also, if you enjoyed this blog post, please share using the easily clickable options to the left of the content column. Thanks :-; . I’ve been asked a lot lately about creating a schedule for young horse training. People want to know the exact age certain task should be started, and when they should be finished. It’s hard to try to explain to some people this is question that can’t be answered without involving the horse in the conversation. Yes, of course, there are age and related growth issues. Staring too early or moving too quickly can create damage that can’t be undone. But so can discounting the equine mind in your training regimen. Some horses are smart. Others need a different engagement approach to understand. There are those that will test you at every step – and you better be sure what you’re asking is reasonable before you decide to make an issue of it. Certain young horses beg to be brought into the training process earlier than we plan. Judie (our 2007 Registered Irish Draught Sport Horse mare)was one of them. We knew she was going to be big and didn’t want to begin under saddle training until late in her three-year-old year at the earliest. She had other ideas. So we honored her request and did some very light training with her early. Judie’s been an amazing eager pleaser who wanted to start training long before we planned on it. She proved an unflappable, kind and careful steed on the trails for a novice rider employee. Ground work didn’t satisfy her as she had been watching other horses being ridden. It’s funny how some horses seem to see the world. Judie’s been a fantastic learner and eager pleaser with every under saddle request we’ve made of her since. Just being included when she asked seemed to solidify her conviction that training was fun. Her response has been to try even harder to do everything right. Leah was another one we started early. This wasn’t due to her expressing a strong desire to begin training, but more because we needed her for a job. 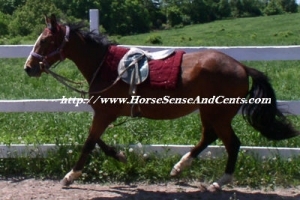 This is a remarkable little filly that we grab for a variety of farm needs. Most horses – no matter what age – wouldn’t be able to do what she does around here without angst or injury. In this case, we had a green employee who was providing help with client horses coming in to be started under saddle, but wanted the learning experience of a project she could do on her own. There aren’t many young horses I’d entrust with the schooling project (the horse did a lot more teaching than the human), but Leah’s special. Leah is my go-to gal for so many jobs at the farm. It’s amazing to witness her clever and cooperative approach to handling challenges with personality and zeal. There have been a number of times I’ve sent client horses back after some preliminary training because they were just too young to process or physically handle the demands of riding time. Fortunately, my clients care about their horses and trust my judgment, so are willing to give their equines another year or two to grow up before beginning career training. This seems to be a guy thing as these equines are almost always geldings or colts. Starting a horse too soon is a mistake. If he’s too insecure, underdeveloped physically or confused about simple requests (this is often human error, but some horses do need to grow up to be mentally ready to respond as requested), he’ll come to see training with resentment, fear or avoidance tactics. That’s no way to start a horse that will be asked to partner with humans for a lifetime. So, when people ask me “at what age should I be introducing my horse to tack,” my answer is always “it depends.” I get some industries put tremendous strain on young horse bodies at a very early age. Some breeds take years longer to mature than others, requiring more time to physically mature for long and healthy career. Usually, though, no matter what the breed or career he is intended for (that’s a subject for an entirely different blog post), the horse will tell you when he’s ready. Of course, there’s lots of things you can do from the ground while you’re waiting. If you find your young horse doesn’t relish the training time you spend together, consider stepping back to try to figure out why. Maybe he’s been rushed to a point where he’s confused and concerned. Return to ground work in an effort to establish a better foundation. Perhaps you don’t have the confidence or understanding to instill courage in him. This might be a good time to seek out help. Alphas can be particularly challenging because they’re usually clever, willful and watching your every move to determine if you’re worthy. Too many people try to dictate to these horses, or recoil in fear; neither approach works very well. Or maybe, he’s just not ready. Everything you do today will shape how your horse experiences riding time for the next twenty years and beyond. If you’re going to take on a young horse training project, you owe it to the horse to listen to what he’s trying to tell you. This is the time you set the stage for a horse to spend a lifetime enjoying his human interactions – or dreading them. If you find yourself challenged with training issues you’re encountering with your horse, we’ve created some e-booklets to help. These are available on this website and as Kindle Editions for only $2.99 (there’s about 20 pages each). We’ve also created these as audio books available on Amazon or iTunes and a number of other popular venues. 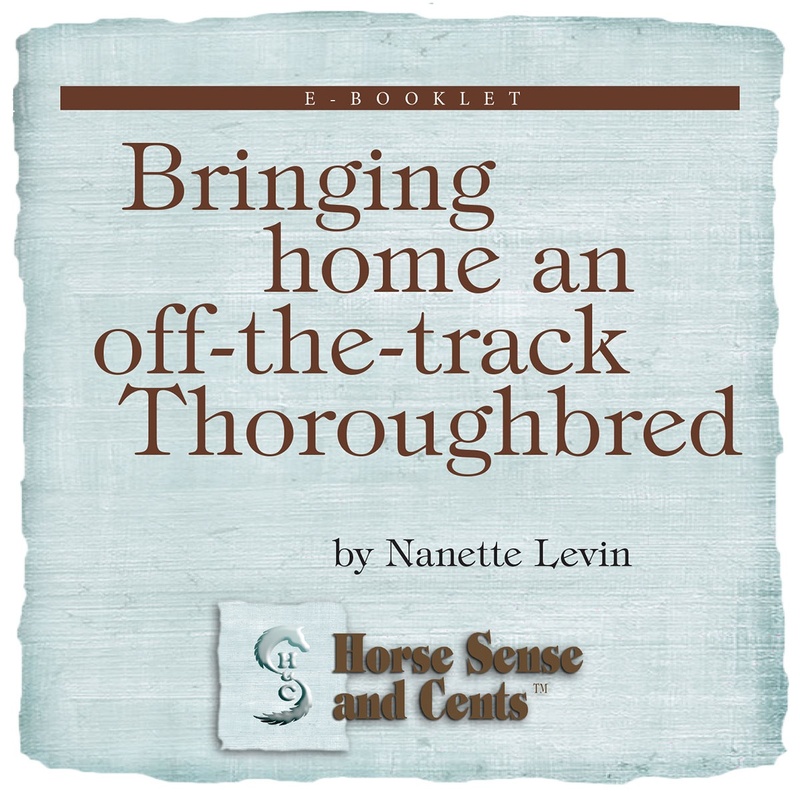 Reaching Alpha Horses and Bringing home and off-the-track Thoroughbred are fun reads with stories, tips and ideas you can implement immediately. If you do pick up a copy of any of these titles, please consider leaving an Amazon review. Thanks! Animals are more intuitive than most people give them credit for. Remi’s certainly not the brightest canine to walk the planet, but she seems to always know when I’m headed downstairs to leave the office instead of taking a trip to the kitchen or bathroom. It’s not that she hears me putting on a coat or readying boots, she’s up and halfway down the stairs before I reach the bottom. This is Clover, my lovable brat. 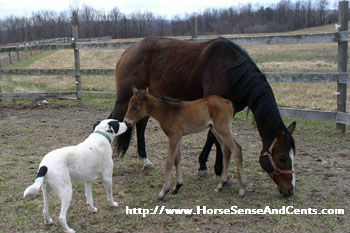 I find the horses at Halcyon Acres® sense a lot of things you might not expect too. What’s amazing is, once you’re able to connect with one or more in a way they understand, you can easily use herd members to help with daily management activities. While training is one way, I tend to prefer asking. Clover is a lovable brat. She’s an instigator and can be challenging to work with. It’s important to channel her energy and engagement if you want to keep the peace – and your sanity. This six-year-old Registered Irish Draught Sport Horse is clever, athletic and has a sense of humor (really). I know I probably shouldn’t, but I can’t help but chuckle watching as she gets the herd racing around on slippery ground, maneuvers an instant 90-degree turn at 35 mph and then watches as others try to follow and start skidding and flopping to the ground as hoofs come out from under them. I swear you can almost hear her giggling. Recently, deep snow, biting winds and too many layers of clothes have slowed me down at feeding times. There are a few rules that are non-negotiable at the farm. Kicking up heels near the meal ticket is one of them. So is being rude by grabbing at food before it’s laid out. Sometimes, though, when winds are whipping and excitement is flowing, they can’t help themselves. Clover started this (of course). She began sniping at the bales before they were opened and distributed and others followed her lead. I let her know I had enough – and targeted her with the message. She got it and also seemed to sense I could use some help. Who knows what goes on in her mind sometimes. Whether it’s a genuine effort to help and protect me (she’s done this enough before it’s not a stretch) or a conviction that if she couldn’t grab, no one else was going to either, but the end result was incredible. Instead of viewing the gate as the entryway to a shark tank, I feel more like Moses as a wide path is cleared in front of and around me as hay is doled out. The first day or two there was some chasing and circling as Clover let every herd member know if they came within ten feet of me they’d incur her wrath. Now, except for the occasional glare, she doesn’t have to do anything. Thanks, Clover! Horses seem to love to have a job – even if it’s a simple one. Think about selecting a horse to help you with a task and you might be surprised at how they jump in with solutions. Do you have a fun horse story to tell? Please share in the comments below. What’s new at Horse Sense and Cents®? It’s been a whirlwind few months with so much going on. Time’s streaked past in a way that has me wondering why we’re not still in August. Almost reminds me of the first time I sent a horse down the lane for a track breeze – kind of a joyous blur seeing but not fully able to focus on the milestones passed along the way to the finish line. We’ve been doing a lot of work on the Horse Sense and Cents® website and products over the past few months. There’s still much more to go, but hopefully the changes will make it easier for you to find what you are looking for on the site. Do feel free to reach out (full contact information is available at the bottom of almost every web page) if you have questions, want to see us offer something new or are having trouble locating the information you seek. Do take the time to look around a bit while here as there’s tons of free information designed to help you reach your training, career or equine relationship goals. Much has been added to the Inventing Your Horse Career pages (although we’re still working on a better organizational strategy). For those still seeking last-minute gifts or stocking-stuffers for the horse lovers in their life, we have some great gifts that can be downloaded for $2.99, $6.95 and $15.99. We’ve just started making titles available as audio products. 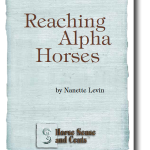 You can now buy the Reaching Alpha Horses e-booklet for to enjoy as a listening experience via Audible.com for $6.95 or on Amazon for only $6.08 – or at no cost with a free 30-day Audible.com trial membership. We expect the title to be available on iTunes and other major online audio retail outlets within the next week. Alternatively, if you prefer reading to listening, the Kindle Edition of this title is only $2.99. 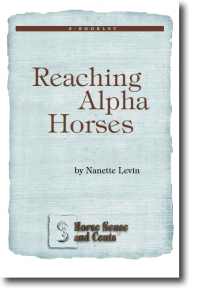 You can buy it as a PDF document here on the Horse Sense and Cents® website. Who hasn’t scratched their heads over the challenges an Alpha can present? This resource will help you customize approaches to get that special, opinionated equine excited about building a partnership. 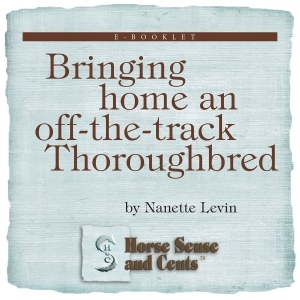 Look for Bringing home an off-the-track Thoroughbred in audio next week. Or, buy the Kindle Edition or PDF if you want a fun, quick read for only $2.99. More than a dozen equine professionals had a lot of fun coming together last year to create the Inventing Your Horse Career Series. We’re running a half-price special on the 9 CD boxed series right now (just enter the discount code HSACLA2012 to save $119). We’ve also created individual MP3 download options for those who want the material in smaller and more affordable doses. You can get the Inventing Your Horse Career MP3s (about an hour a piece) for $15.99 each or $29.99 for three. Beginning in 2013, we’re going to try to publish articles in the blog on a regular schedule, but back it off to twice a month. Of course, if we have something exciting or timely to share, we’ll jump in off-schedule, but it seems better for all to know when new posts are coming. Is there a particular day that’s favored by you readers? If so, please note this in the comments below or send me a private message. The day of the week makes no difference here, but frequency does. Also, if there’s a topic you’d like to see covered, say so and we’ll try to respond accordingly. We’re going to start producing the free newsletter monthly (if you’re not signed up, just enter your name and e-mail address on the right column of this page). This wound up taking a lot more time to create than anticipated so to keep it interesting, fun and relevant, quality over quantity seemed like a good move. For those who subscribe, we’ll send out some other fun surprises periodically, but limit the formal treatise to twelve times a year. We’re in the final production stages of the long-awaited title by Rob Fera (the working title is Bringing Up Baby, but we need to change this as John Lyons already claimed that one) focused on foal care and handling pre-natural through 18 months with great information on nutrition, health issues, ailments, training and all sorts of super tips on being smarter about raising a young horse in a way that helps him be his best. This has been a much-anticipated book that we’re excited be close to finishing. Watch for free sneak peak chapters here as we get closer to a publishing date. Some exciting news for us – and hopefully for the readers of this blog. Recently we were named one of the top horse blogs with 25 others in the nation by Bel Rea. You can see the top 25 list here (we’re in some pretty good company). Just figured I’d share the news. I’ll probably revisit this later, but, frankly, needed to get the badge up to grab the imagine for a project we’re working on. Thanks for all you’ve done to support this blog and other activities associated with Horse Sense and Cents. You all are so special and clearly a big reason for being noticed as one of the top horse blogs.